If there is just one wool or cashmere overcoat that can be worn with virtually any suit you have hanging in your closet, this mens full length black wool overcoat is it. This is a solid black full length in a single breasted style made of wool and cashmere blend fabric by Vinci. It comes 48 inches long which will cover your calf and has 3 buttons and slash side pockets that will make you look great and keep you warm. 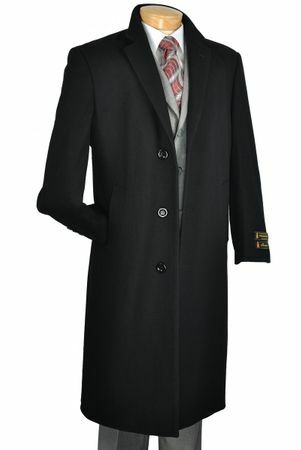 It also features a long center vent for ease of movement and will not be your last cashmere coat you own once you realize how good you look wearing this mens full length black wool overcoat. Fabric is 70% Wool 25% Viscose 5% Cashmere with a nice soft feel.